Posted on November 25th, 2008 by Dave Johnson. 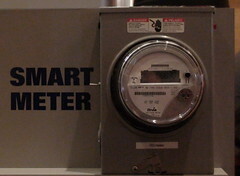 Filed under cloud, smart grid. The discussion about what cloud computing is over at James’ blog is still raging. While cloud computing is fascinating and a great opportunity for making IT more efficient in it’s own right. However, I have been thinking about smart grids a lot (and so have a lot of others like the better half of RedMonk and even The Google), which in short are electricity grids that have the ability to both provide and accept both electricity and information about the prices of said electricity all over the same wires making it possible for companies, government and people to choose to use electricity when it is cheap and generate it when it is expensive, thus, helping to reduce the amount of generation infrastructure required in a network to cover load peaks. A classic example of this is when everyone in England gets home from work (or when the East Enders comes on the television) they turn on the kettle to make a cup of tea, the issue of only rich people being able to drink tea aside, resulting in a large spike in consumption that would (hopefully) be reduced by higher instantaneous pricing. Today, users are charged for cloud computing in a predictable way at a rate of about $0.05 to $0.10 per hour depending on the provider. However, as we move to smart grids (and we already are with companies like Trilliant and GridPoint leading the way) we are going to see changes to the way cloud computing and most other service are billed for. In the cloud all your data needs to be backed up and sitting on hard drives somewhere that likely need constant power (like Amazon S3) while other parts of the cloud are more temporal in nature like the load on a CPU (Amazone EC2). All this adds up to a more complex cost structure for the cloud provider. At any rate, this post is not about smart grids but instead about smart clouds and the eventual reality where computing power has a temporal cost associated with. This will create a new niche for software that manager can manage CPU and storage load according to electricity price as well as new developer skill sets with a bigger focus on batch processing rather than real-time processing. I am just sort of thinking out loud here but think that the rules of the cloud (and development in general) will have to change if we move to a low carbon economy. As I write this I can’t help but think about applying the real-time pricing concept of smart grids (and maybe smart clouds) to other areas of IT as well. For example, why not have dynamic pricing on bandwidth? When there is plenty of bandwidth in the middle of the night let me have 100Mbs and charge me the same price! Tags: cloud, cloud computing, smart grid.